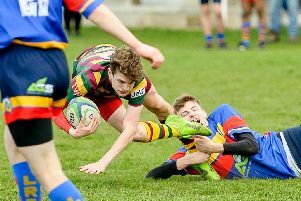 After a free weekend for most clubs on the local scene, all Rugby’s league teams are back in action on Saturday (November 17) - and nearly all at home. Midlands 1 West leaders Newbold welcome Dudley Kingswinford to Parkfield Road, while in the East division Rugby Lions host Wellingborough at Webb Ellis Road. Over at Fenley Field, Old Laurentians’ visitors are Silhillians, while their 2nd XV play them away. Also in Midlands 2 West (South) Rugby St Andrews have a fairly local derby with Southam making the short trip to John Tomalin Way. After their Vase exploits last week, Rugby Welsh are on the road this time at Atherstone in Midlands 5 West (South) and in the same division AEI Rugby host Trinity Guild.